Courtesy of Brooke Nance Photography. Stacy Monk never imagined that standing could be so invigorating. Her normal life is fast-paced. In addition to driving for Uber full-time, she also gets her four grandchildren to school every weekday. She’s struggled with back pain for most of her adult life — “I think I have a pinched nerve” — and was looking for a new treatment when she saw a notice at her local library advertising free Empower yoga classes at the nearby church. Her sister and nephews in Nashville have become big fans and practitioners of martial arts and Tai chi in the last several years. They encouraged her to check it out. 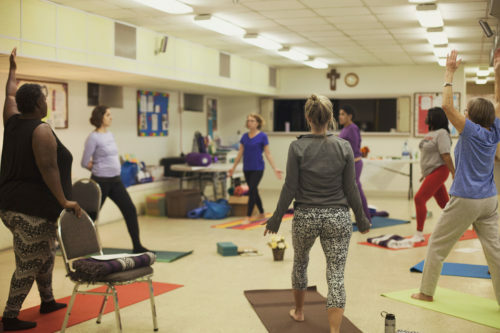 Monk is now one of a dozen regulars at Empower Yoga, a class for women that has been meeting weekly in the basement of St. Stephen’s Episcopal Church in McKeesport for the last two months. The course was the brainchild of Alison Popivchak, a therapeutic yoga instructor who’s been teaching in the Pittsburgh region for the last five years. 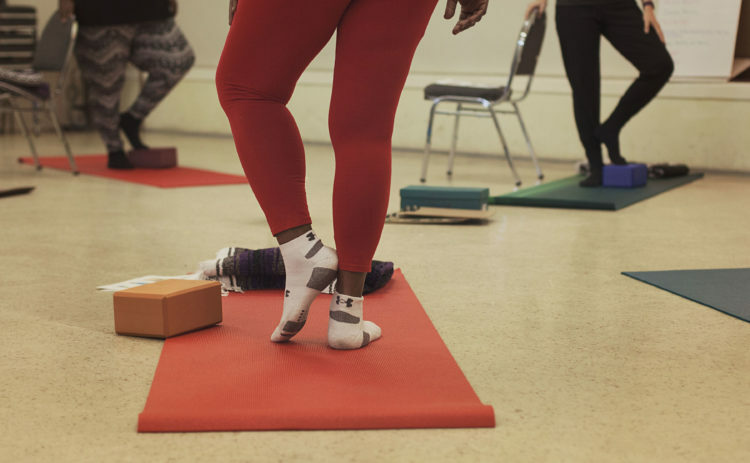 Empower’s 10-week program explores the ideas of wellness, learning and practicing yoga together and building community with a foundation of acceptance, strength and peace, Popivchak says. She’s also learned a few stretches, and she says they do help her back. “I’m not doing great at the positions,” she says with a laugh. Photo courtesy of Brooke Nance Photography. The benefits of meditation and other mindfulness training have been widely acknowledged by medical professionals. Regular meditation sessions have been linked to decreased levels of stress, enhanced concentration and cognitive performance, and improved overall physical health. In the Pittsburgh area, mindful education has worked its way into a wide variety of settings and social services. 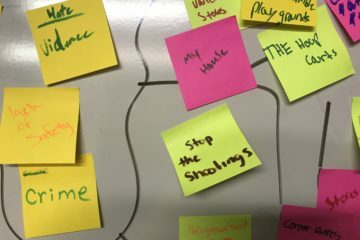 Local nonprofits like Awaken Pittsburgh and Yoga in Schools have been collaborating with local schools to develop centering classes and curricula for students of all age levels for the past several years. In May of this year, the Dalai Lama’s personal doctor, Dr. Barry Kerzin, held a series of seminars extolling the virtues of mindfulness and meditation to thousands of UPMC nurses. The seminar was hosted by the UPMC Center for Integrative Medicine. Dr. Kerzin spoke about a study that found that in only six weeks of meditation, there’s evidence of change in the body. The more meditation, the healthier the immune system. However, like so many life-changing medical services in the Pittsburgh region, mindfulness training has not been available to all. It’s an imbalance Popvichak has found time and again in her own career, which has focused on teaching in “non-traditional settings,” including many workshops in the Monongahela Valley. She has ongoing classes at UPMC Western Psychiatric Hospital as well as UPMC McKeesport, and has also taught several courses with students from the Homeless Children’s Education Fund in Pittsburgh. In all of these disparate communities, Popvichak has found no shortage of enthusiasm for her classes, “just a lack of resources,” she says. 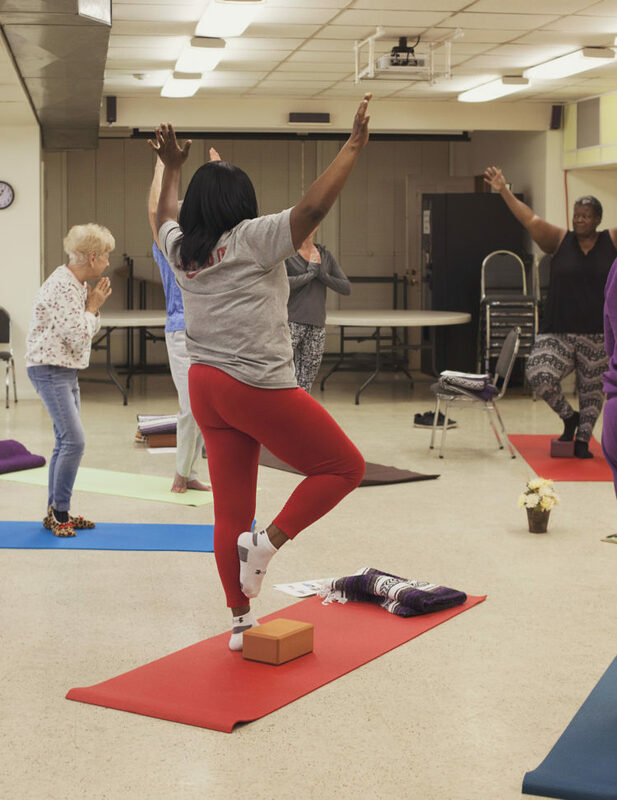 While Empower gets some support from Carnegie Mellon University as part of a larger health study, Popvichak says the majority of their support is simply from volunteers, often her fellow yoga teachers from around the city. In addition to helping with the course, the team offers in-house childcare for several mothers who take the class. While she is thrilled by the community support, Popvichak says that Empower will need some kind of regular, institutional support to be a sustainable, ongoing program. Though she is undoubtedly an expert, Popvichak says the larger goal of her yoga is not following the dictates of an expert, but finding small, practical ways to bring calm and joy into our often hectic lives.